Wow them with your floors! Our professional floor care services will ensure your floors make a positive impression. Our complete floor services include cleaning and sanitizing, honing and polishing, repairs and restoration, sealing and protection, and more. 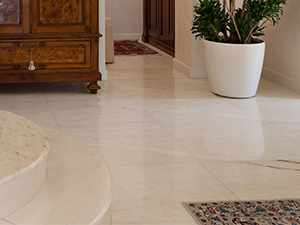 The great thing about natural stone floors is that damage can be erased, restoring the like new elegance of your stone. Traffic and use can cause the appearance of marble, travertine, slate, granite, and other natural stone to dull. Chips, scratches, and other damage can occur. However, replacement likely is not necessary. Our expert technicians have the knowledge and experience to resolve a host of problems from etching and lippage (uneven tiles) to repairing cracks and holes to applying regular or color-enhancing sealers. If you have a matte/honed finish that you want to be shiny—or vice versa—we can change any finish to what you have in mind. We can restore cracked, uneven concrete. Our expert technicians can grind, hone and polish, densify, and seal your residential or commercial concrete floors to a glossy, reflective finish. Our concrete services include concrete prep for coatings, concrete polishing with various sheen options (high, medium, matte), warehouse floor maintenance, anti-slip treatments, repairs, stamping, recoloring (staining or dyeing), sealing, and more. Terrazzo is restored using the same process that is used in restoring marble and other natural stone. Most terrazzo surfaces, coated with waxes that have a tendency to yellow and collect dirt, are repeatedly stripped and re-waxed. However, with our natural polishing process there's no need to wax and strip. Properly sealed and maintained terrazzo retains its beautiful shine and color and reduced maintenance costs. Check out our Case Study Gallery to see some of our amazing work. Trust your floors to the professionals at CEI Surface PROS. We guarantee dramatic results. Contact us online or call (239) 455-1167 for a FREE estimate on any of our professional floor care services throughout South Florida – Port Charlotte, Ft. Myers, and Naples. We will travel up as far as Sarasota.